Import data from a standard C array into an itk::Image. ImportImageFilter provides a mechanism for importing data into an itk::Image. ImportImageFilter is an image source, so it behaves like any other pipeline object. This class is templated over the pixel type and the image dimension of the output image. Definition at line 43 of file itkImportImageFilter.h. Definition at line 60 of file itkImportImageFilter.h. Definition at line 122 of file itkImportImageFilter.h. Definition at line 54 of file itkImportImageFilter.h. Definition at line 69 of file itkImportImageFilter.h. Definition at line 53 of file itkImportImageFilter.h. Type of the output image pixel type. Definition at line 79 of file itkImportImageFilter.h. Definition at line 51 of file itkImportImageFilter.h. Typedef for the output image. Definition at line 50 of file itkImportImageFilter.h. Definition at line 59 of file itkImportImageFilter.h. Region type alias support A region is used to specify a subset of an image. Definition at line 76 of file itkImportImageFilter.h. Definition at line 57 of file itkImportImageFilter.h. Size type alias support A size is used to define region bounds. Definition at line 72 of file itkImportImageFilter.h. Definition at line 52 of file itkImportImageFilter.h. Definition at line 58 of file itkImportImageFilter.h. This filter does not actually "produce" any data, rather it "wraps" the user supplied data into an itk::Image. This is a source, so it must set the spacing, size, and largest possible region for the output image that it will produce. Get the pointer from which the image data is imported. 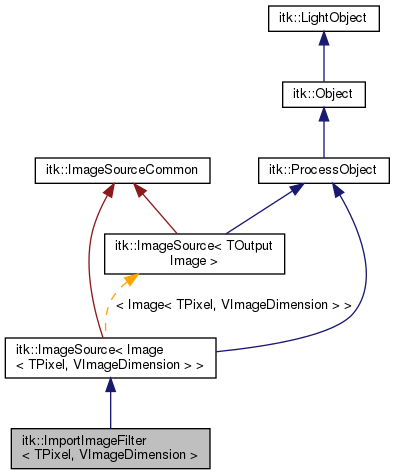 Reimplemented from itk::ImageSource< Image< TPixel, VImageDimension > >. Get the region object that defines the size and starting index for the imported image. This will serve as the LargestPossibleRegion, the BufferedRegion, and the RequestedRegion. Definition at line 105 of file itkImportImageFilter.h. Set the pointer from which the image data is imported. "num" is the number of pixels in the block of memory. If "LetImageContainerManageMemory" is false, then the this filter will not free the memory in its destructor and the application providing the buffer retains the responsibility of freeing the memory for this image data. If "LetImageContainerManageMemory" is true, then the ImageContainer will free the memory when it is destroyed. Set the region object that defines the size and starting index for the imported image. This will serve as the LargestPossibleRegion, the BufferedRegion, and the RequestedRegion. Definition at line 98 of file itkImportImageFilter.h. Definition at line 159 of file itkImportImageFilter.h. Definition at line 161 of file itkImportImageFilter.h. Definition at line 158 of file itkImportImageFilter.h. Definition at line 156 of file itkImportImageFilter.h. Definition at line 162 of file itkImportImageFilter.h. Definition at line 157 of file itkImportImageFilter.h.